The philosophic and religious use of the character can be analyzed in two main segments: one meaning is "doctrine" or "discourse"; every school owns and defends a specific Tao or discourse about doctrine. In the other meaning, there is the 'Great Tao', that is the source of and guiding principle behind all the processes of the universe. Beyond being and non-being, prior to space and time, Tao is the intelligent ordering principle behind the unceasing flow of change in the natural world. In this sense Tao gains great cosmological and metaphysical significance comparable to the Judaeo-Christian concept of God (albeit stripped of anthropomorphic characteristics); the Greek concept of the logos; or the Dharma in Indian religions. The nature and meaning of the Tao received its first full exposition in the Tao Te Ching of Laozi, a work which along with those of Confucius and Mencius would have a far-reaching effect on the intellectual, moral and religious life of the Chinese people. Although a book of practical wisdom in many ways, its profoundly metaphysical character was unique among the prevailing forms of thought in China at that time. The religion and philosophy based on the teaching of Laozi and his successor Zhuangzi is known in English as "Taoism." Even if often said to be undefinable and unexplainable with words (even Chinese ones), the present article focuses on the Tao of Taoism. The Tao is the main theme discussed in the Tao Te Ching, an ancient Chinese scripture attributed to Laozi. This book does not specifically define what the Tao is; it affirms that in the first sentence, "The Tao that can be told of is not an Unvarying Tao" (tr. Waley, modified). Instead, it points to some characteristics of what could be understood as being the Tao. Below are some excerpts from the book. 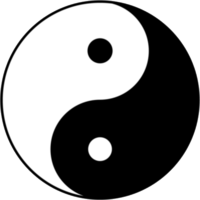 In the Yi Jing, a sentence closely relates Tao to Yin-Yang, asserting that "one (phase of) Yin, one (phase of) Yang, is what is called the Tao". Being thus placed at the conjunction of Yin and Yang alternance, Tao can be understood as the continuity principle that underlies the constant evolution of the world.